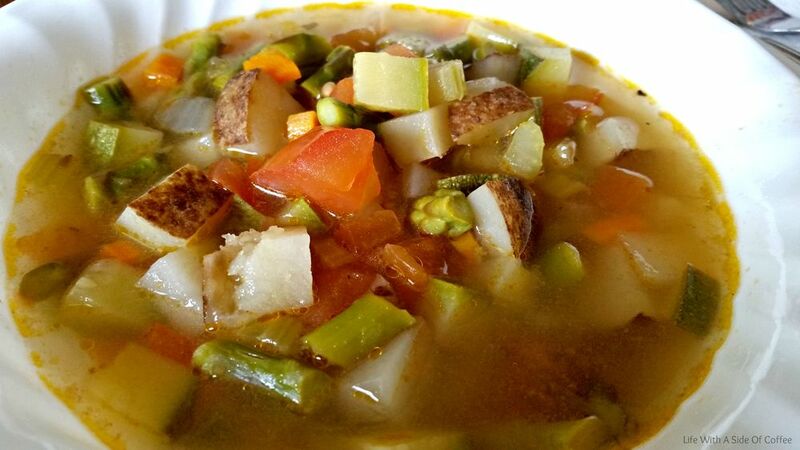 The Summer Vegetable Soup had everything but the kitchen sink included. It was really simple to make and incredibly delicious. It includes zucchini, potatoes, asparagus, tomatoes, onion and more. To give it extra flavor, I used vegetable broth instead of water but you can use either or even make your own veggie broth. I prefer using broth when making soups. I always look for low-sodium, organic so the salt content isn't outrageous. It just adds another level of flavor to the recipe whether it calls for it or not. The soup is meant to be eaten cold, like gazpacho, but I didn't have enough time for it to cool so it was warm for us. It was nice and hearty but not too overwhelming. This made a great lunch the next day. The Spareribs were not an Italian recipe but a classic in the Tucci household. Stanley wrote how they make them for all kinds of parties. They're a favorite! I did half and half with our spareribs. I used Stanley's recipe which has an Asian twist and I did a traditional barbecue. Both were fantastic. I actually loved the Asian twist from Stanley's recipe. It was sweet and savory, my favorite combination. The ribs were super tender as well. They practically fell off the bone. I marinated the ribs, both Stanley's recipe and the regular barbecue for about three hours. Throw everything in large ziploc bags, mix it together and you're good. No dishes necessary. Last but not least, the Fresh Tomato Salad. This was a great accompaniment to the spareribs. It was simple, tasty and great with some toasted bread. In fact, we basically used it as bruscetta. How can you resist? Cooking with Stanley so far has been really great. It's forced me to go outside of my comfort zone and try new things and it's also made me more comfortable with certain ingredients. This has been one of my favorite meals so far. What's been yours?